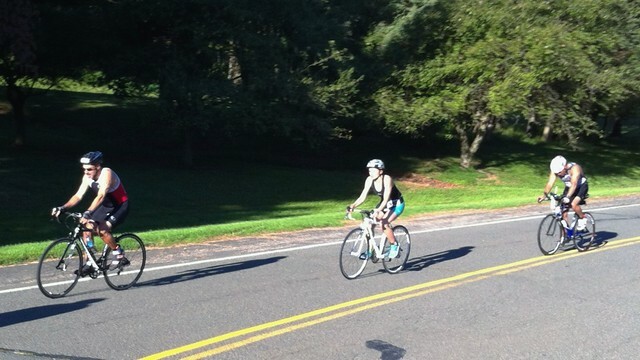 back in september* I competed in my second triathlon. 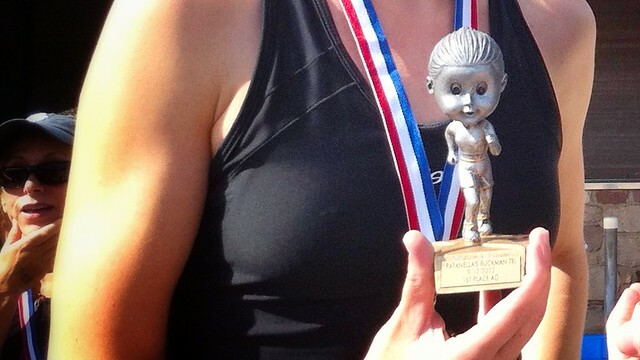 I did a second triathlon only because the first one, which happened the day after my thirty-first birthday, was so frustratingly unpleasant that I felt like I needed to have a better experience to counteract it. after my first triathlon my impression of the sport was that you spent twenty minutes letting giant men try to drown you in mucky garbage-water before trying to run a race. there’s nothing like having your lungs full of long island bay water to take the fun out of a 5k. going into my second triathlon, I set three goals for myself — one goal for each leg of the race — that I thought would help me feel like I had experienced a good tri. I was not entirely convinced it was going to be fun, but I was hoping for at least a sense of satisfaction. goal number one: swim freestyle. in the first triathlon, I ended up doing the backstroke for the majority of the course, fighting a strong current and a crowd of oncoming limbs. 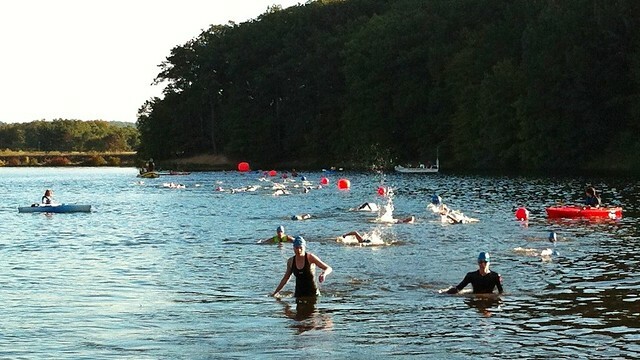 it was truly unpleasant, not to mention s-l-o-w. it was really important to me to experience a good swim, and I chose the right triathlon for it: warm lake water; a smallish group of competitors (there were 62 people in my wave); five minutes between starts; and only 400 meters. I started out swimming in somewhat the wrong direction, and felt myself flailing a little as I course-corrected. my breathing went out of sync with my strokes and I found myself thinking, maybe I should just do the breaststroke. I frog-kicked for a few seconds to catch my breath… and then I started to swim. really swim! I know this is no big thing to real triathletes, but I was so happy just to be moving through the water, one stroke after another, watching the buoys slide past when I lifted my head up to breathe, watching the bubbles left behind by the racers in front of me as they kicked their feet. goal number two: bike smart. I had never biked seventeen miles before, at least not without breaks built in by traffic lights. I didn’t know what to expect from a course advertised as “challenging,” with “rolling hills,” except that it would probably make my legs tired. I mostly wanted to enjoy the bike (which was the only part of the first triathlon I liked at all), use my gears wisely, and not burn my quads out so much that I couldn’t run fast. starting the bike ride, I was behind pretty much all the men and probably about 70% of the women. immediately after turning out of the park entrance, the course took us into a long downhill stretch, and I was going faster than I’ve probably ever gone on a bicycle before. it was exhilarating, and terrifying, especially when I found myself in the midst of a pack of athletes jockeying for a position out front. for a few minutes I was freaking out and deferring to all the other riders when they got close to me, but then something clicked in my brain and I realized it was just like city biking during rush hour — you have to find the space and squeeze your body into it, and then your presence will maintain the integrity of the space. most of the time, anyway. weirdly, imagining the surrounding bikes as cars and buses made it a lot easier for me to get aggressive and stand my ground within the pack. a few miles out of the start, the pack thinned. the ride was so beautiful, I had to let myself take my eyes off the road a few times. the sun was hanging along the top of the treeline, its light glittering across the surface of the reservoir and casting long, elegant shadows down the roadways. at one point we rode by one of those roadside speed indicators, and I watched it flash at each bicycle that went past: 26, 25, 28, 27. I thought to myself: if I could ride 27 miles per hour in the city, I would get to work in fourteen minutes. the bikes were traveling in little clumps, with long empty spaces between them. I started focusing on one little clump at a time, slowly pushing myself closer, drawing the distance between us shorter as if I were tightening a winch. I didn’t pay any attention to riders coming up behind me. I didn’t stand up and pump to keep up with them when they powered into the uphills. I just kept shifting to maintain a steady pedaling cadence, kept inching closer to the group ahead of me, and kept catching up. in a way it felt like climbing up a rope: hand over hand, one pull after another. when I realized I was getting close to the end of the bike course and had passed dozens of other racers, all I could think was I’m doing it right! so it turns out I really like bike racing. the last mile of the course was a grueling, relentless uphill that forced me onto my smallest chainring and into single-digit speeds. I kept downshifting, pedaling as smoothly as I could to keep my momentum. a lot of the men around me were struggling to keep their pedals turning, standing up on them to force them down with gravity as much as with the power of their muscles. I inched past a few of them and caught up with another woman, who called out a hello to me. I was glad that the other racer agreed with my brain. I was pretty thrilled to be doing it right. goal number three: run fast. 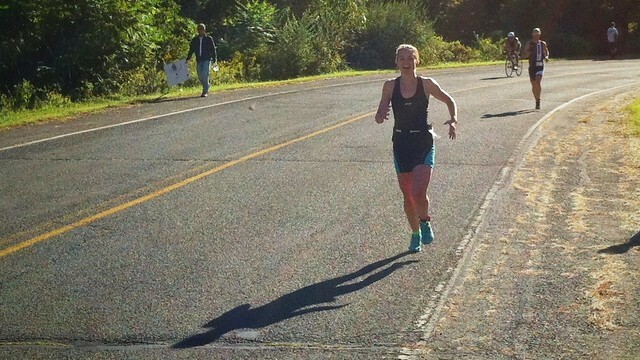 running is the thing I’m good at, at least as far as triathlon legs go. 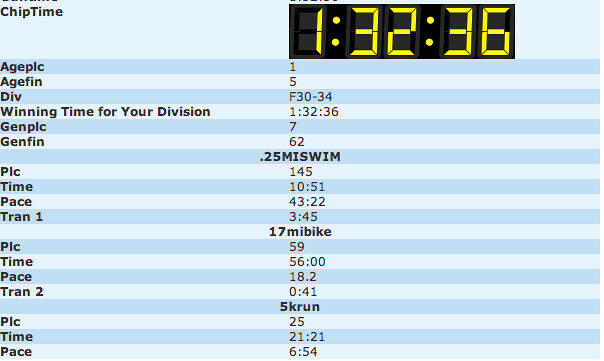 before my first triathlon, I set a goal for myself of a 25 minute 5k. that first race had a short course, and I finished in about 23 and half minutes, but my drowned-lung pace was 8:09, too slow to finish a true 5k in less than 25. after that experience, and not knowing what my quads would feel like after 17 miles of rolling hills, I told myself I would be happy to be done in under 30. secretly I was still gunning for the 25 minute mark. I did not feel like I was going fast. I felt like I was running through jello. but when the emcee took the mic away from his face, nodded towards the woman a dozen meters in front of me, and said, “go catch her!” I leaned into my stride and did my best. and I caught her. I was pretty damn happy to be the second-fastest woman on the run course, and even more happy to have finished the 5k at a sub-7 pace. I can — or at least I have in the past — run a 20 minute 5k** but the difference between just-running and triathlon-running is enormous, and I really did not know what to expect from myself after nearly an hour of hard cycling. * good grief. apparently my writing is slower than my swimming. **with a lot of effort followed by a lot of almost falling over unconscious from lack of oxygen. don’t let me come across as anything other than a hobby jogger here. Posted November 11th, 2012 in pacing & racing. 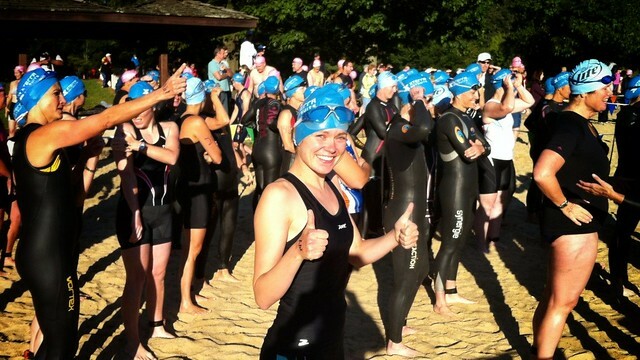 i did my first triathlon last summer, and while i enjoyed it (immensely challenging as it was), i found the whole experience to be a bit manic – going super fast in one event, rushing through transitions without dawdling and onto the next. didn’t do another one this year but i plan to someday. haya, the tri was harder than the tough mudder! one big reason is that a tough mudder is not a race, and LOTS of people do it damn slowly. (I actually found this somewhat frustrating in the places where it was too crowded to run past them.) but the bigger thing is that you only have to run like half a mile at a time — then you stop and do an obstacle. a few of the obstacles are mentally challenging (like the electrocution ones, ugh), but physically I find the whole thing much, much easier than a triathlon or any true race. you should do it a mud run! it is like getting to play on giant playground equipment for grownups. ps what’s with the head on that trophy?! isn’t it so weird? it’s a bobblehead. first place in each division got the runners, second place got the bikers, and third place got the swimmers (which were super creepy because of their goggles). you should have seen the overall trophy — it was really something. I think it had stars and stripes. Wow! I love this description of your races. The evocative clarity of the experience had me feeling like I was really there. I loved the images you painted. Of you rising up out of the water like a seaweed monster. Of the mind state required to . . . . “find the space and squeeze your body into it, and then your presence will maintain the integrity of the space”. Of an octopus girl running through jello and gleefully taking the challenge to “go catch her”. I’m also inspired by how organized and clear you were about your goals. I’m glad that you are acknowledging each victory in achieving them. I feel so much admiration and sympathetic Joy!